My favorite part, besides the food, is the football pool. I'm not a huge football person, but always have a great time on game day filling the squares and harassing our guests for cash. Rather than quickly zip out a grid on a piece of copy paper with a sharpie, this year I decided to create a little graph that I can put in my scrapbook later. Sell the squares. We usually sell them for $1 per square. After they are all filled up, have the kids draw numbers from 0-9 from a hat and fill in the shaded areas, 0-9 for each team. 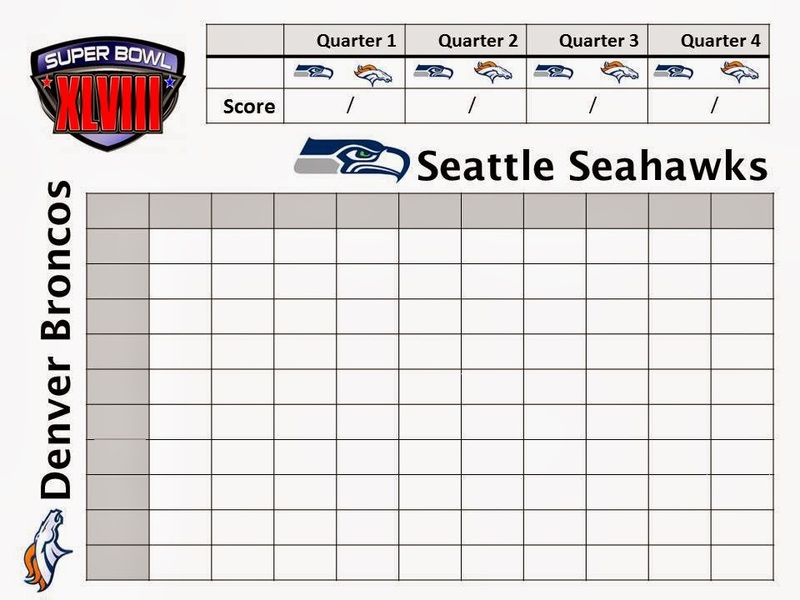 Game time is a lot more fun for everyone now that we can root for scores as well as our favorite team to win. We usually do $12.50 for quarter 1 and 3, $25 for the half, and $50 for the final score. Download the football pool for free here. Well, obviously things changed a bit around here. 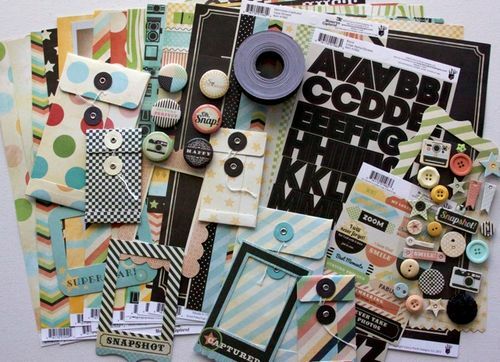 About a month or so ago I sent an email to Gossamer Blue and American Crafts to resign my position. My priorities have just changed. I am committed to my family and my students. There simply wasn't time for everything and something had to change. 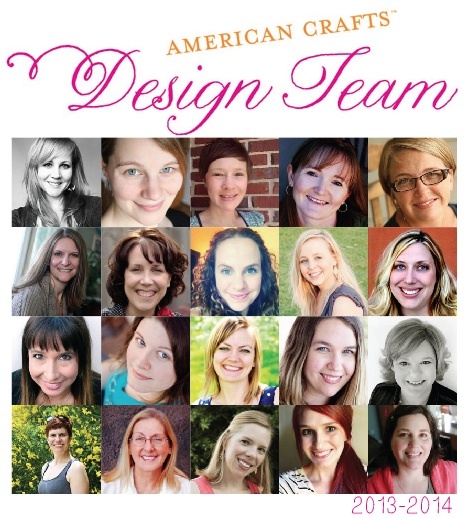 I have spent several years on Design Teams with affiliate links and holiday deadlines. It feels SO GREAT to craft when I feel compelled to do so and to try different things. I have been knitting and quilting and making home decor. I will start sharing as it makes sense to me. To be honest, it has been liberating and inspiring to make things for my girls and to create things for my home without the pressure of a deadline or a color palette or a trendy product that I need to sell. I've been part of the crafting industry for too long to just disappear. But this girl definitely needs to regroup. P.S. Project 12? Project 12 is mine. 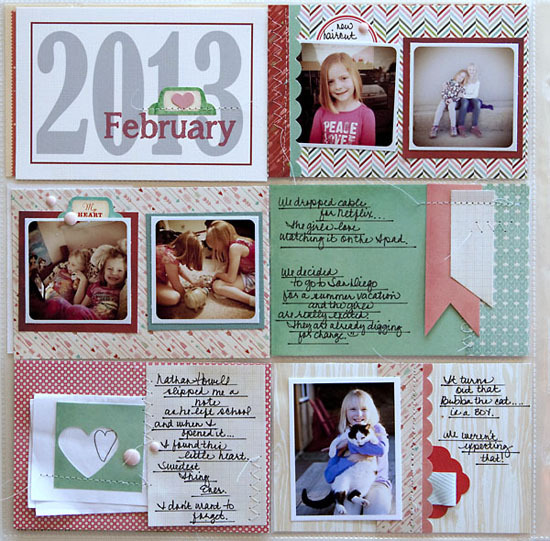 Creating a monthly recap is a challenge that I have been hosting since 2008. It appeals to me now more than it ever has before and I think it's the perfect form of memory keeping for the busy mom who still wants a creative outlet. There's NO way busy Mom's are doing a daily record keeping system. That just isn't realistic. Stay tuned! my first AC blog hop! 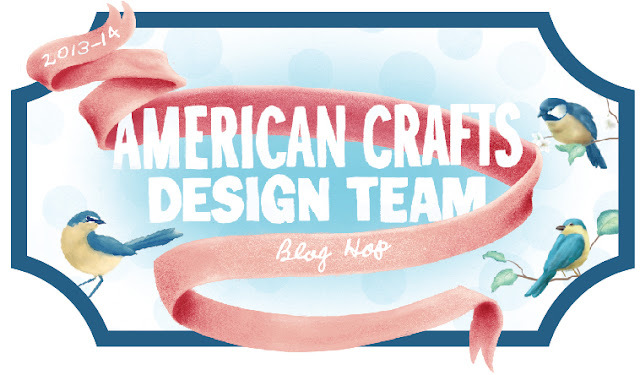 I am excited to be participating in my first American Crafts blog hop. It is such an honor to represent such an amazing company! I have been part of the papercrafting industry for a few years now. For most of that time I worked part time in the health insurance industry. It was a way to work from home and care for my girls without having to use daycare. My career in health insurance was really a gift to my family. I got my BA several years ago. When Payton went to Kindergarten I knew it was time to pursue a dream I have always had for myself. It didn't make sense to stay home and craft all day while my husband worked for the family. I felt I had something bigger to offer the world, I guess you can say. I went back and got my teaching degree, my master's degree, and my Reading endorsement, and still managed the other parts of my life. I am SO proud of myself. I have talked myself out of this opportunity a few times, because I knew how much work would be involved. I am so glad I finally followed through. The best bit? I graduated, and right away, I got a job. Yep! I am a first-year teacher this year. I teach 3rd grade and I am SO excited about it. I can't wait to make a difference in the best way I know how. I am obsessed with Amy Tan's Cut and Paste Collection. It's a really smart, eclectic mix of products. 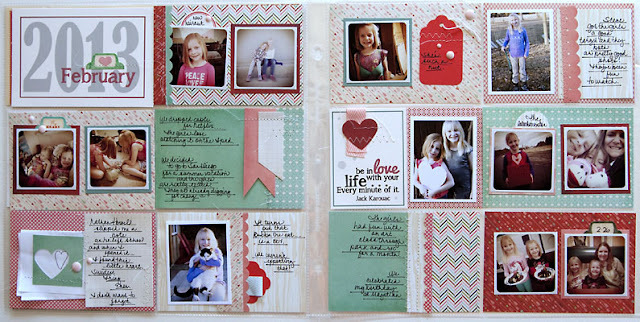 This layout started with the ONe Two Three pattern in this collection. My eye was immediately drawn to the idea of '13 for 2013. Because of the abstract way the numbers were created, I had fun with them and used my sewing machine to stitch a '13 amongst the pattern in the paper. I then used my Silhouette to cut out the word "grad". I then chose patterns from the collection that complemented the coloring and also drew out the yellow in the gray print. In recent years, journaling has become more of a focus in my work, especially handwritten journaling. It's faster than printing or typing something out. It captures my handwriting. It also often allows me to say more. I don't pre-plan my words. I just start writing and hope that it comes out straight. I don't line up each line, as you can see. I do try and offset it a bit so that it isn't just a clump of writing. And then I often underline what I wrote. 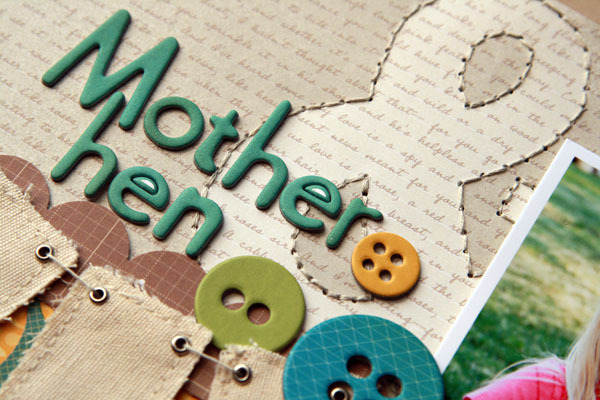 Other products include cut out accents, bits die cut shapes, and the rotary phrase stamp. 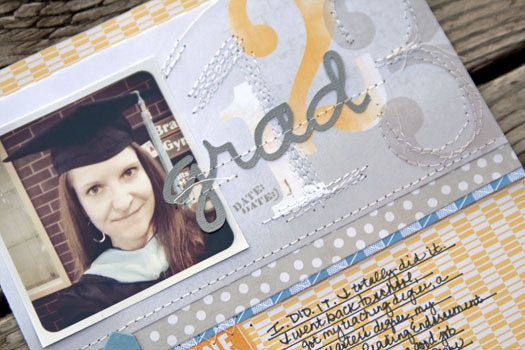 Ultimately, scrapbooking is about capturing your memories, not creating a pretty page. I am really focused on trying to utilize both, though. I want to create a layout that sparks a memory later, or serves as a reminder to a great story, but also do so with products that are still interesting to look at years later. 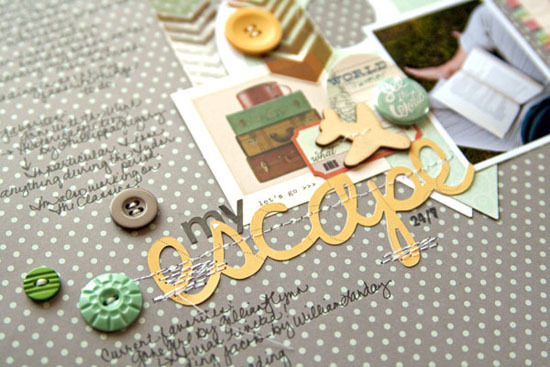 Scrapbooking for me has also always been a creative release, so it's important to me to create pretty things too. All products on this layout are American Crafts, of course. 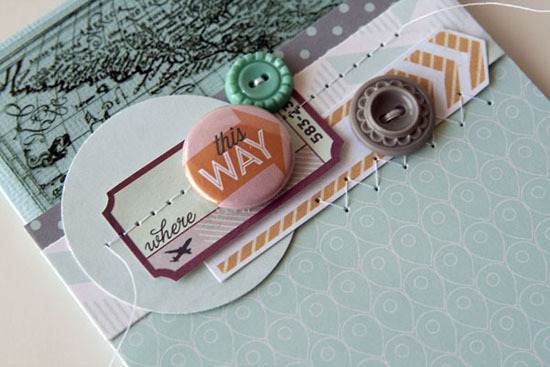 The cardstock, adhesive, and even the precision pen are manufactured by American Crafts. 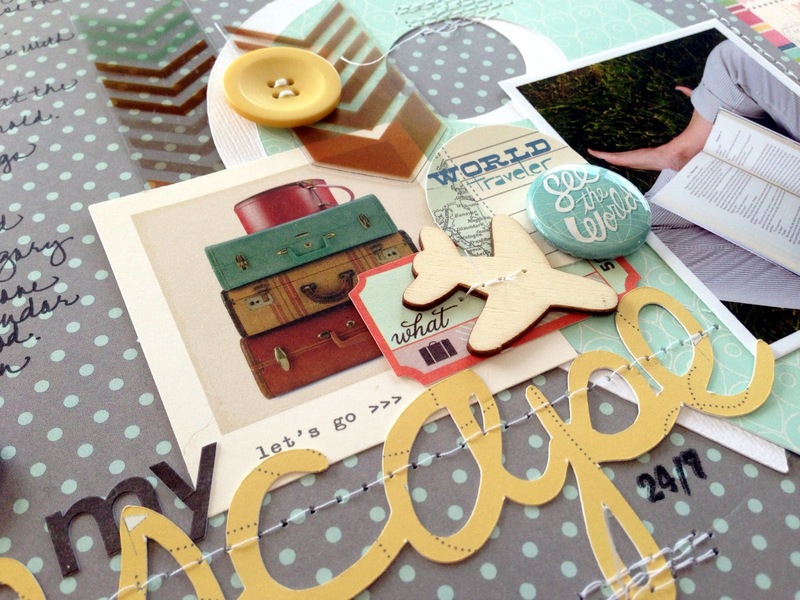 You can't have a blog hop without having another destination to head to! But before I go, of course there needs to be a giveaway! Blog hops are more fun when a giveaway is involved. To enter, please leave a comment. I will choose a winner September 14 and sending you a goodie bag of products from American Crafts. Here is the full design team list. Next is Madeline Fox! Have a great day! And wish me luck! School starts Monday morning. You should see my room! Kraft butcher paper on the walls, chalkboards, magnetic metal sheeting, and patterned paper decor. It's like a layout in there! As I was searching my Pinterest Words board for a quote to share, this decal from Urban Outfitters jumped out as the perfect post for today. My little family is heading out for a little California adventure. It isn't as far south as we thought we'd go this summer, but we still plan to have a great time. I always love getting my girls to the beach. Morgan's very first camping trip was at the Northern Oregon Coast when she was barely walking, and a memory I'll never forget is how we'd set her down on the sand, she'd dash out to the surf, get her feet wet, and we'd pick her up and run up the beach to set her down again. She had so much fun! She ran and ran in her fleece rainbow pants from the Gap until she suddenly stopped, sat down, and cried, finally realizing how cold the Oregon waters were. She's a beach babe and I love getting her to the ocean each summer, the beach being somewhere around a 5 hour drive from our house. She doesn't believe that the ocean can be warm and we were hoping to prove it to her, but it turns out the water where we are headed isn't that much different from where she's been before. Bummer. But just like in 2005, we'll be chasing her out of the surf yet again, I'm sure, and Payton won't be far behind. 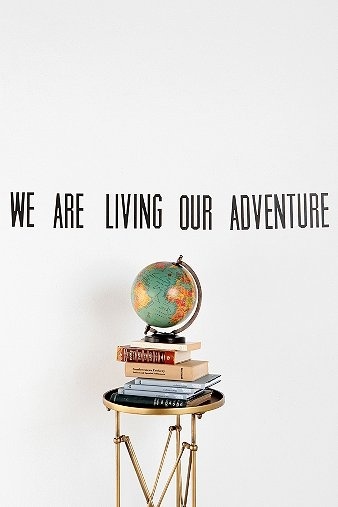 Just like the quote, we are living our adventure. I hope you still have summertime left with your family to do the same. School doesn't start until after Labor Day here, so we have a few weeks left to soak it up. I mean, seriously. Sense and Sensibility and Pride and Prejudice are a couple of my favorite movies. I'm giddy. I never watched Felicity (although of course I know about the famous haircut), but I am a Keri Russell fan, so I'm excited. Two of my favorites from her are August Rush and the Magic of Ordinary Days (I think that was a Lifetime movie). (Click the picture for the trailer). A rainy Thursday hello to you. Thunderstorms here. Can't complain much. It's keeping us from attending the county fair and I'm not a huge county fair fan - #soexpensive - I've been busy catching up on the Bachelorette and Big Brother because I've been camping all week and didn't have hookups or cell service. This is great for family bonding but not for reality TV! Poor Des. I feel bad for her. But I think Brookes did the right thing if he wasn't in love. I get so tired of this silly shows that undoubtedly turn into a People magazine cover about the "breakup". Why I get sucked in every time I don't know. i think it's because it's easier to learn to knit when I am only partially attentive to the show I'm watching. 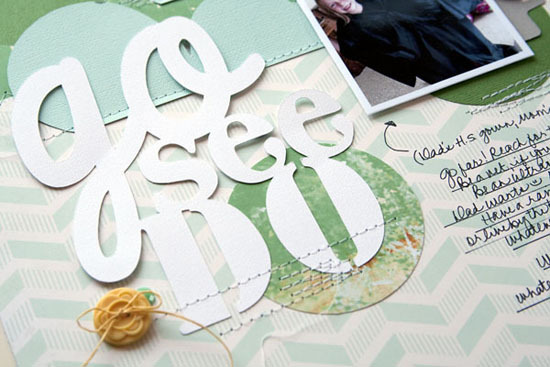 The August kits are up for sale at Gossamer Blue and they were so much fun to play with! I opened my box and was inspired by all the travel themed stuff. The challenge initially was that I don't travel much so didn't have a plane ticket stub and an Iphone photo of my kids in their row 7 seats C and D airplane seats. That said, I didn't have to go back in time to find photos to play with. I was able to twist the products to work with current life events and I am really happy with how it turned out. I even used airplane veneer on projects about my girls and myself. I knew immediately I wanted to use this silly photo of my girls in Steve's high school graduation gown and my current Graduate school graduation cap. It wasn't until I had the layout finished that I remember to double check the files Lori created for this kit and saw a similar title idea, lol. 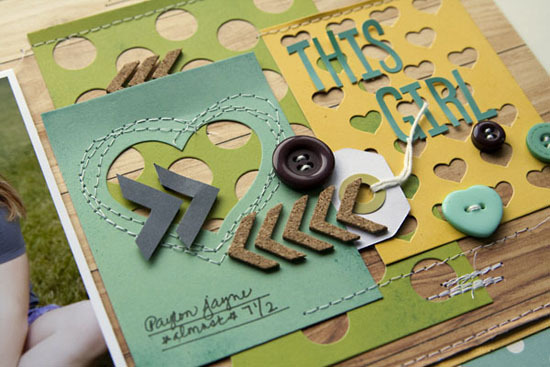 I also LOVE the chevron paper that Mitchell designed, so grabbed that and used almost the whole sheet. 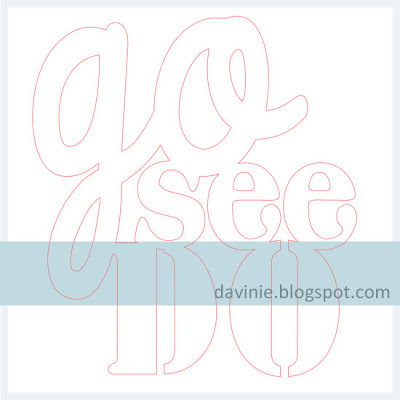 If you'd like to use "GoSeeDo" as a title for your layout, I made it available for download as a studio file. I created this title with my Silhouette. I have seen this title many times over the years but never really wanted to use it until now. Isn't it funny how that works out? Now that school is over and life is returning, I'm back to the library, overdue fees and all, lol. I have been soaking up a lot of great novels I have missed over the last couple of years and had to document it on a layout. Read anything good lately? Please share. Again, I created a Silhouette file for this layout, and I made it available for download via studio file should you want to use it. I'm not normally this techy but had some ideas I wanted to try with my projects this month. Edited to add: The font used for my title is called Lollihop. I love this script because it isn't too slanty, and it welds really well with my Silhouette. I don't normally pay for fonts but I must have with this one, because it's in the Silhouette store. :) My other go to favorites for scripty fonts are Pacifico and Lobster Two. Both of those are free. If you have any questions on my design process or anything, please ask! If I were to do more step-by-step tutorials in the process of a layout I designed, would that interest you? I'm thinking of adding that as part of my work each month so that you can recreate it if you want to. 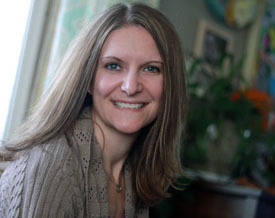 As I get in the habit of routinely blogging again, I thought I'd start with a post about what I've been loving lately. There are a lot of beautiful things being created right now, brilliant products being perfected by science, and a lot of great creative inspiration out there. I'm a girl who likes to wear her hair down and parted on the same side. I also have fine hair that can tend to curl, which means that the early morning hair decisions that I make will set the stage for the day. I can't wear a hat unless the plan is to wear it all day or I'll have hat-hair. You know what I mean. I tend to get sunburned on the top of my head a lot which eventually leads to peeling, which is just gross, so I am always on the hunt for sunscreen that won't grease my scalp and look icky. My friend told me about this sunscreen powder and I checked it out. It works so well I had to give a little shoutout. 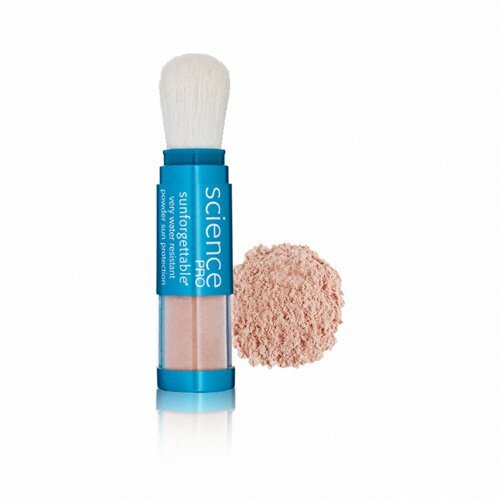 It's called Colorescience , it looks like makeup, goes on without a trace, and works really well! I have been using it all summer on my hairline and my face. I use it on the girl's faces too. The initial purchase is a wee bit spendy but it has refills. I've been told one applicator will last for a few months, which is perfect! Skincare and sunscreens are a top priority for me lately, so I had to pass on a great product. You can purchase a water resistant version, and there's even eyescreen! I've never heard of an eyescreen before. That's new to me. Okay, now that we have our faces and our phones happy.... The next thing I wanted to share are the Spring chinos from Boden. I wouldn't begin to describe myself as fashionable or trendy. I prefer to shop via the internet which means a lot of Gap, Old Navy, and some Banana Republic or maybe a touch of Ann Taylor Loft. That said, the Boden catalog is one of my favorite pieces of mail. I'd love to order one of each. One of my staples this Spring has been these chinos. I've been wearing them rolled up with flip flops or wedges and I just love them. My favorites are the gray pinstripe pair. 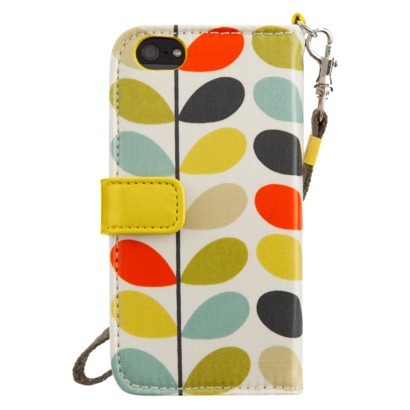 I bought mine on sale and was just checking the site to order more colors and found them on clearance so had to share. Maybe they are on clearance because they are called a "Spring" chino. I don't know and I don't care. I love them and ordered more. True, they are running out of various sizes, but my favorite color seems to be in good supply so check them out. $39 is a great price and it doesn't take much to get free shipping! I was really excited to see these pants on Clearance. I just added 4 pairs to my cart including Terracotta for $23.40! Who doesn't need a little terracotta in their life? Am I right? 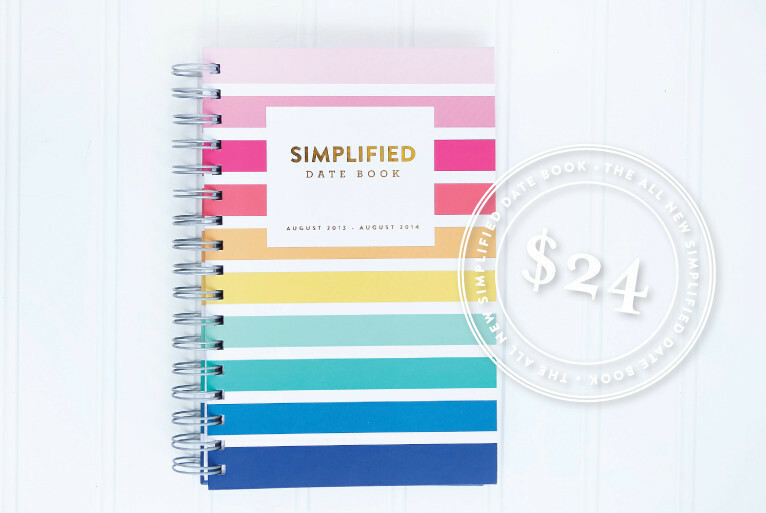 And with summer soon over and a new school year about to start, of course I need a good planner. I found Emily Ley and I really like her take. With August only a few days away it's time to get organized. School, soccer practice, and maybe a little hip hop or hula dancing for the girls (we are still trying to decide), my kids certainly have a busy schedule coming up. Steve is always trading shifts and working overtime so it's important for me to keep track of his schedule too. And then there's me. If I don't get my own classroom this year, I'm already on the sub list for three districts, so keeping track of my personal schedule is going to be crucial, because my crafty schedule needs to fit in there too. It looks like the year ahead will be exciting! I hope to keep all the squares filled. 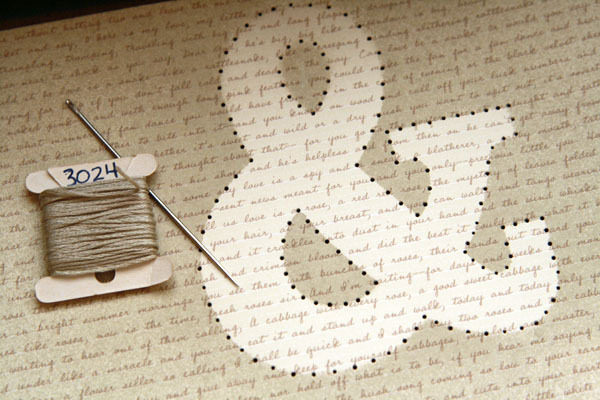 Lastly, of course I want to add something crafty to the list of favorite things. 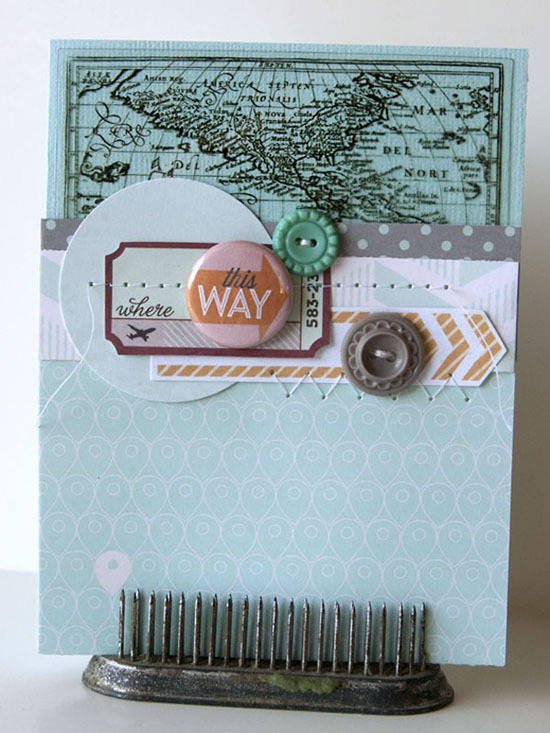 I have a few things in mind but for this post it has to be the August kit from Gossamer Blue. You can check out the August Lookbook here with a a peek at the colors, some of the products, and the guest designer. I guess that's it! Back soon. On a whim, I applied. I use American Crafts products on every layout and have been a fan of what they've been coming up with lately. I'm honored to be chosen to represent this company and look forward to sharing projects soon. Have you seen the CHAS13 releases so far? I'm excited! First, thank you so much for your kind words regarding my previous post. I really hesitated putting it all out there, but it helped to write it down and look at it. Life sure is precious. And unpredictable. The whole "enjoy every moment" takes on a new meaning when you realize how little control you really do have sometimes. I managed to get a bit of my groove back in time for the July kit from Gossamer Blue, and I'm so glad I did! It felt good to get creative again and I really like how my projects turned out. We bought a ski boat and have taken it out several times already this summer. We have hesitated for years, sometimes wanting a fishing boat, sometimes wanting to do without a payment, but an opportunity presented itself to go in with friends on a used boat, and we jumped for it. So far it has worked out perfectly! We have taken it out together, and taken turns. Our friends were a perfect choice because not only do we love them like family, our schedules also mesh. Because of Steve's career with the Fire Department, and my soon-to-be career in schools, we aren't weekend people. We can often go out on a Wednesday, etc. Our friends, on the other hand, are M-F people. So it's been great. We got a new tube for the kids to try, and in order to build up some bravery, we have to driver really really slow. They'd rather stop and swim. But we are working on it. And we have been having a lot of fun. 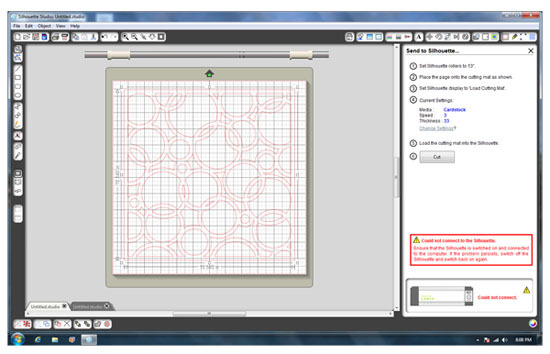 To create the bubble background, I started with this image from the Silhouette store. You could create this yourself but I went with easy. I resized it a bit smaller than 12x12 because I have issues with lining things up perfectly on my machine. 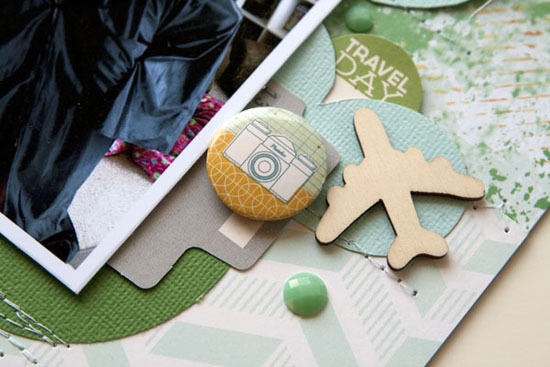 After I cut it out of the yellow print designed by Mitchel Kraft for GB, I started arranging my photos and decided to cut into it to make it a more interesting design element. I just cut circles away until I was happy with the layout and then adhered. After that, I trimmed some circles from cardstock and mounted them on pop dots, and then added alphas, embellishments, and of course, tons of stitching for texture. The digital elements for the main kit weren't available to me when I created this layout. 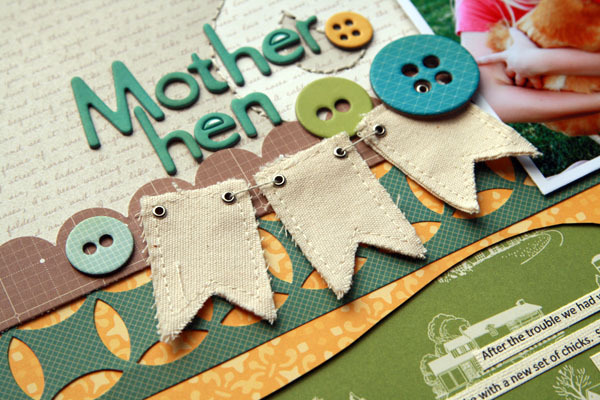 My next project features only new release products from Fancy Pants Designs. Every once in a while the kids play together with smiles and enjoy how lucky they are to have each other. It's rare, but it happens. The title was created with my Silhouette and the Pacifico font. I love many cursive fonts, but this one welds together the best for cutting which is why I stick with it. Another fun product from Fancy Pants is that chalkboard tape. The roll is HUGE and should last a long time. That was fun to play with. I've stared at that photo a few times with confusion. I can't believe how old Payton looks in this photo! Her legs are so long! 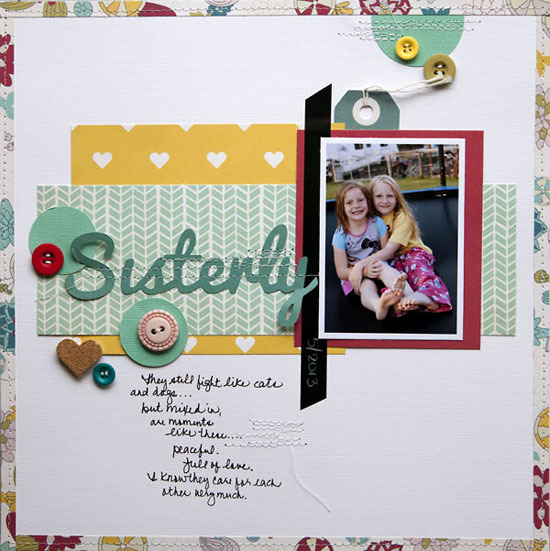 I love the trend using die cut images on a square/rectangle piece of paper so layered a few pieces for this layout. I also had to mix in some chevrons, the gray are hand cut, and added some fun buttons too. I put the layout under my sewing machine and winged it for the stitching around the heart. I didn't always get it quite in the right spot, but that's one thing I like about stitching. I'm not looking for perfection. Did you like what you saw in the kit? 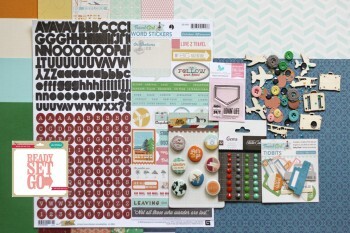 Check out this link from the Fancy Pants Designs blog for a chance to win the July 2013 kit. The deadline for the prizes is July 17. Thank you for stopping by! I will be back soon with some Project 12 updates. Suffice it to say, the past few months have been tough and documenting the little details has been a bit of a challenge. But I'm anxious to get back to it! I adore this challenge so much. As you know, Project 12 is a monthly take on documenting the everyday. 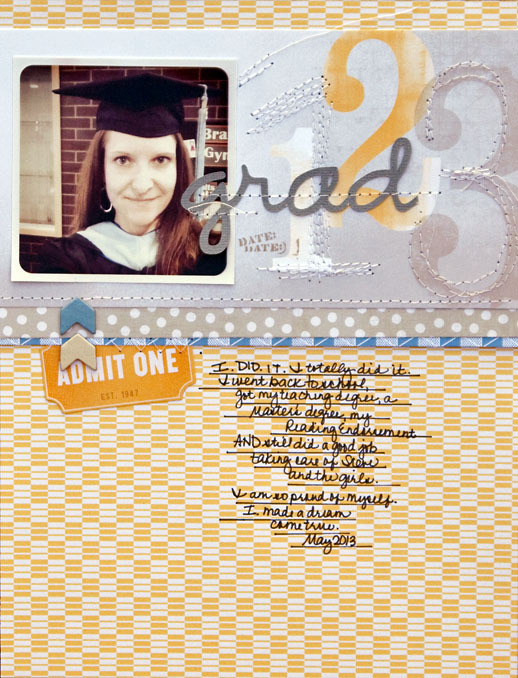 You can read more about Project 12 via the tab above and also at the Gossamer Blue blog here. Well, February certainly swooped in and out like a flash, lol. You wouldn't think 2-3 days off the end of the month would make such an impact but they certainly do. 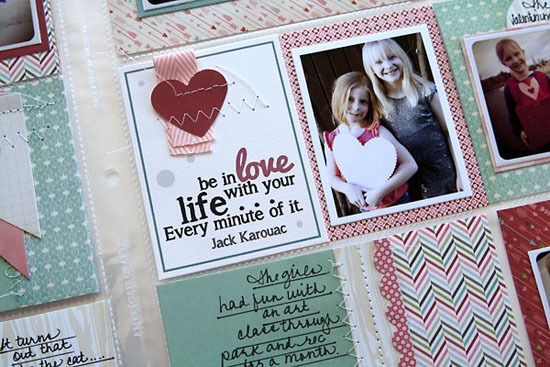 I was happy to have an opportunity to use Basic Grey's True Love paper pad for my layout this month. I adore any color palette that includes a shade of teal. I'm not a huge red person, so this was a great mix for me. I had more photos than I thought I would to choose from this month. Most were taken with my phone. I still made sure to get out my Canon to make sure I had higher quality digital photos in the record books as well. On Valentines Day I took a photo of my girls holding a cardstock heart with both, to make sure I had images from both places. I got a very special note from a very special friend in my class at school this month. I am so glad I have a great way to preserve it. It was just a little heart on a folded piece of paper but my heart about split in two and doubled, it touched me so. It's proof that I'm totally doing the right thing with school. I get so much out of knowing I'm making a difference. 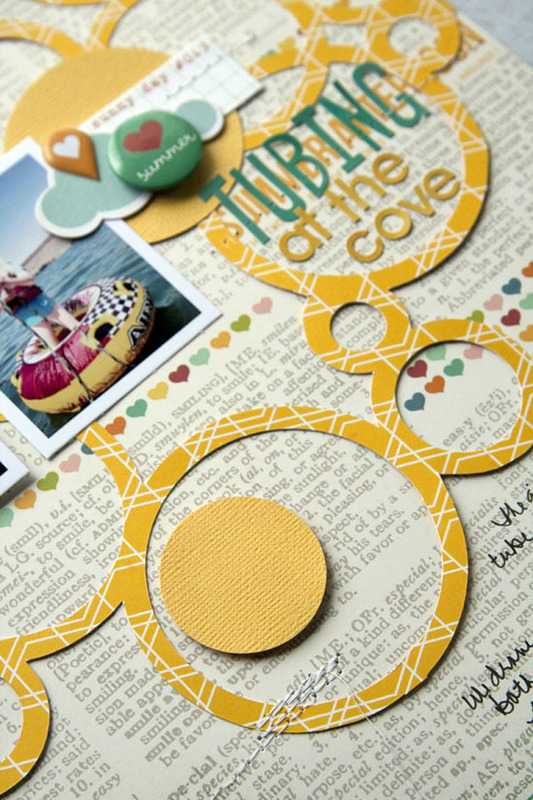 I had fun creating the printables for this month's layout too. I used the color palette in the Bits & Pieces Add-on to influence the look of these two pieces. 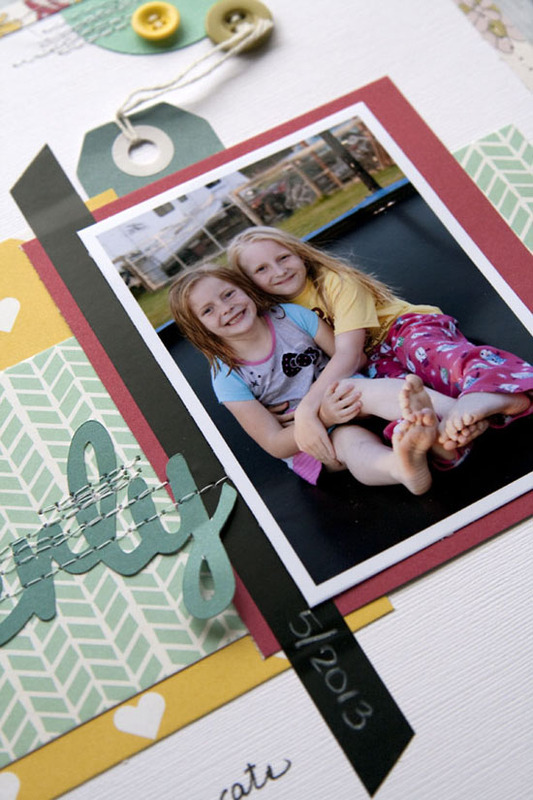 As you can see on my layout I always trim a big border around my cards. 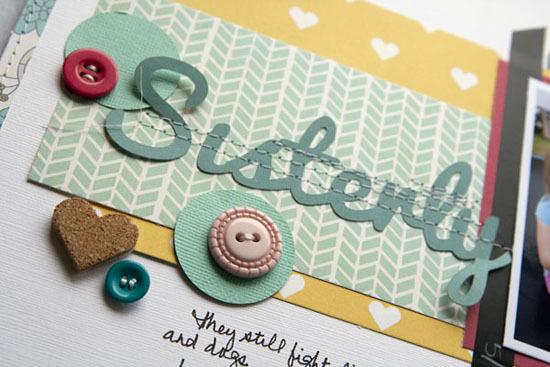 I also like to add layers and attach embellishments and stitching to my cards as well. The quote is a fun one. As always, I shopped my "Words" board on Pinterest for just the right quote to use. Of course I was looking for something love related this month, and found this quote by Jack Karouac to be a perfect choice. I am excited to use the March Bits & Pieces Add-on for my next monthly spread. I like the paper pads a lot. 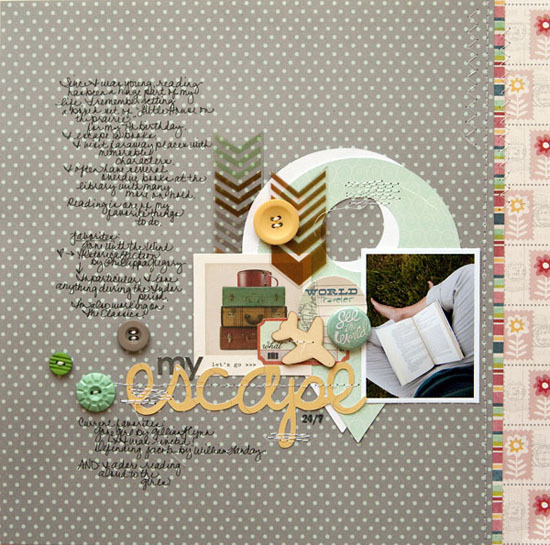 For March it was Color Me Happy from Glitz Designs. FUN. 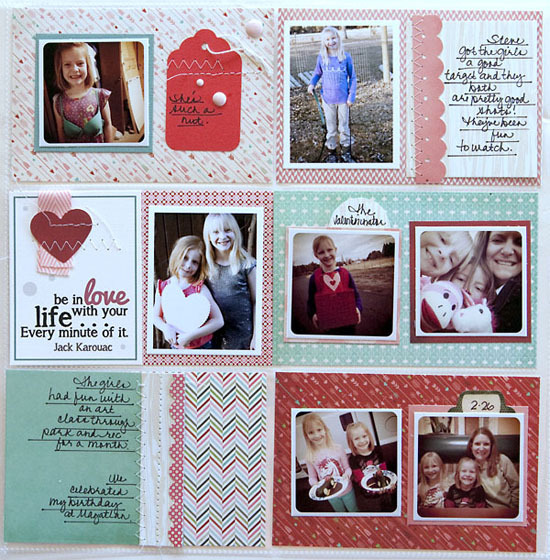 You can check out my layout and Michiko's layout using the March kit on my blog post here. My friends at SCT are playing along this month with a fun prize which includes Cards Map and a subscription to SCT. Having these issues in your hands is always a fun treat so it's a good prize! Thank you for playing along and supporting this challenge! I am working on getting .png files for my calendar and quote cards, so let me know if that interests you and whether you have any trouble with these items. A few years ago I hosted a blog post on the SCT blog about masking with mist and stitchery. I just happened to see it linked on Facebook and realized I never did post about it here so thought I'd share since this trend seems to be coming back again. I decided to play with the ampersand mask for this layout. 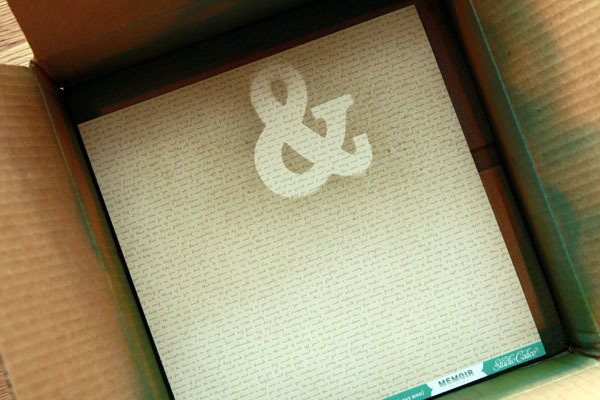 I’m going to creating a mask with the ampersand and spray over it with Mister Huey mist. 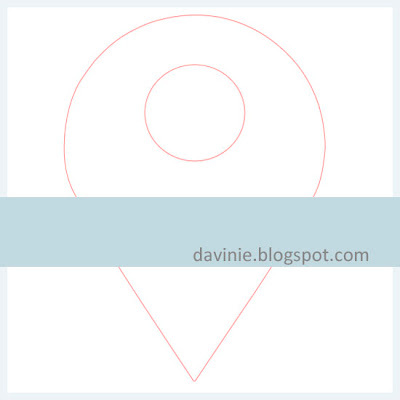 So to start, I needed to determine where on my layout I’d like this element to be. Then I put my base paper in a box, to help contain the spray, and layered the mask over it. 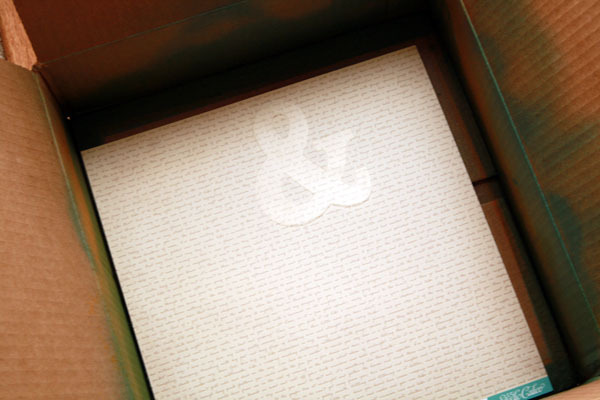 After doing that, I stood back with my spray, and lightly spritzed it over the ampersand. I wanted a monochromatic look, and for the mask to stand out just a little, so used the color Clay over this mask. Remove the mask, and you’ll see the ampersand shape, with the misted color around it. 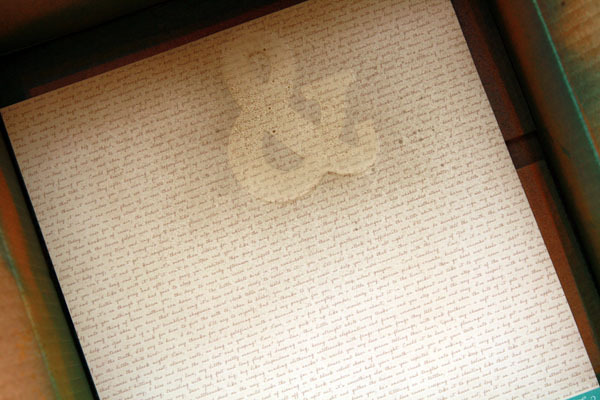 I still wanted to maintain a monochromatic look, but I wanted my ampersand defined, so hand stitched around the edges. To do that I used the same needle that I hand stitch with, and pierced holes around the edges of my shape. Its hand stitching and I don’t want it to look perfect, so it was okay that each stitch wasn’t evenly placed. You’ll also notice that the piercing was closer together on corners, etc., without being too close or you’ll perforate the paper. I then took my DMC floss, which comes in 6 strands, split it into 3 strands, and hand stitched around the edges of the shape. This created a fun detail to this element on my page. 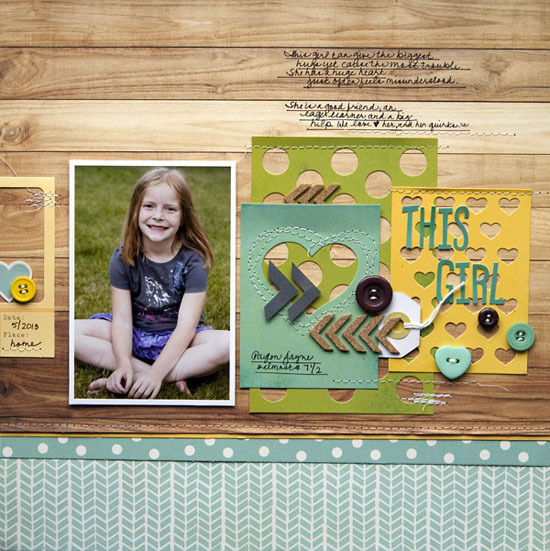 For the rest of my layout, I created layers to add more texture, and a fun photo of my daughter with one of her chickens. A year and a half later and I still like this layout. :) That's a good sign! Sunshine is still clucking along in the coop too as Morgan's favorite chicken.